Legends T20 League in USA – Can cricket win back the land of America, one of the game’s first proponents? Can cricket impress America,from where it was banished a century ago? Which were the two teams to play the first International cricket match? Too easy. England and Australia. Let the buzzer bray and the red light glow. You are wrong. The first international match was played between two North American countries- a rivalry that lasts till date and is one of the longest rivalries in the sporting world. The rivalry between Canada and the United States of America is as obscured as America’s cricketing heritage. USA was smitten with cricket in the 18th century and once hosted a club that was compared to the imposing Australian team. The American president George Washington once wielded the willow and cricket games in America attracted as many as ten thousand spectators and bets as much as 1.5 million US Dollars (adjusted for inflation-120, 00 US Dollars then) for each match. An American cricketer had the lowest average among all bowlers in the English county season of 1908 and an Australian Test team was vanquished twice by an innings by an American club. Americans named their head of the state as “President”, taking a leaf off Cricket clubs’ book, which addressed the head of the clubs as president. Imperial Cricket Conferenceâ€™s (as ICC was known then) blithe attitude towards cricket in the USA, baseballâ€™s burgeoning popularity since the end of the American civil war and youths turning towards golf and tennis all spelt the end of cricket in America. The commercialization of baseball, basketball and American Football and these sports strongly etching themselves to Americaâ€™s pop culture resulted in cricket as a merchandise falling head on in the American market. Almost half a century later, cricket for American youths was (and is) an arthropod that chirps at night. Most of them could not wrap their head around the fact that a sport could last for five days and a wait for five days for this said result can at times end up in vain. More than a century later, with parents being worried about the damage American football inflict on their childrenâ€™s head, baseball going down a slippery slope in the North American country and cricket donning the voluptuous scanty lingerie called T20 which lasts as short as a game of baseball, cricket has got it chances to begin its second innings in America to woo its ex. Cricket was played in America in the beginning of the 18th century. During the American Revolution cricket was played by troops and after the American independence the sport started flourishing along the eastern coastal belt of the American mainland. The Philadelphia Cricket Club was found in 1854 followed by the establishment of Germantown and Young America clubs in 1855. In the region between New York and Philadelphia as many as 5000 people took to cricket. The New York press devoted more space to cricket than baseball even as late as 1855. Teams from England toured the USA and Canada from 1859 to 1872 and the English touring side in 1872 had W.G.Grace in it. However, ignominious defeats at the hands of these teams made the Americans presume that they will never be good at the English sport and eventually paved the way for them adopting baseball as their game. The insidious decision by cricket clubs to sponsor, affiliate and adopt baseball clubs, ultimately became cricketâ€™s nail in the coffin. It is also believed that the fast paced gameplay of baseball, in comparison to the slower strategical gameplay of cricket, gripped the hearts of Americans. Baseball usurped cricketâ€™s position as the â€˜peopleâ€™s gameâ€™ in the United States of America after the end of the American civil war and cricket was reduced to an amateur sport. The plummeting sport of cricket was given an upward kick by the Philadelphian cricket team which ushered in the golden age of American cricket. During this period, America produced cricketers cut from the finest of silk fabrics, in Bart King, George Patterson and John Lester. The Philadelphian team managed to beat the touring Australian test team by an innings in 1893 and 1896. The tour of England in 1897 saw the American team beat Sussex by 8 wickets and another tour in 1903 lead English observers to compare the American team to the Australian side. However, a slump in 1908 foreshadowed the demise of American cricket. Nonetheless, the biggest contributing factor to the decline of cricket in Philadelphia was the Imperial Cricket Conferenceâ€™s decision to exclude America from international cricket, allowing only those which were a part of the British Empire to continue playing cricket internationally. Soon, members of cricket clubs started disowning cricket and cricket clubs started disbanding themselves, drawing the curtains on cricket in America. The last first class game in America was played in 1913 and almost a century later, cricket, despite being the second most popular sport in the world, is a strange contest to the Americans. Since, the decline of cricket in the early 20th century, baseball, basketball and American football have engrossed the American public and enthralled them, unleashing abiding exuberance. But, much to cricketâ€™s delight both American Football and baseball are in the decline in the USA, at least according to media reports, which shows that the door is still ajar and not completely shut for cricket. The number of kids playing baseball in America has been in decline for the last 20 years and the average age of baseball viewers is steadily showing an upward trend. As per Nielsen ratings, fifty percent of those who watch baseball are older than 55, an increase by 14 in a decade. The annual survey of ESPN sport poll found no baseball player in the list of 30 favorite sports figures of the American youths. Another startling report says that 14% of those who are between 18 and 34 are less likely to show an interest in baseball. The number of Kids watching baseball has also died down with the contribution of kids to baseballâ€™s TV audience sharply falling down from 7% to 4% in ten years. The World Series tournament during last yearâ€™s fall saw the lowest rating ever with only 12.2 million viewers watching the game on TV. Rich Luker, a sports researcher is of the opinion that â€œIf baseball does nothing, theyâ€™ll probably stay flat for another 10 yearsâ€. Less and less kids are taking to the game of baseball and some of the minor leagues in America have been forced to disband themselves. Much like cricket, baseball seems to suffer from the modern youngstersâ€™ penchant for short and intense entertainment. Major League Baseball, in an attempt to quicken up the game has cut down the break between innings to two minutes and twenty five seconds while implementing a new rule that requires the batter to be confined to the batterâ€™s box. In contrast, Michael Haupert, an economist at the University of Wisconsin at La Crosse who studies the business of baseball opines that â€œThe problem isnâ€™t the length, but the perception that nothingâ€™s going on in the game.â€ He also emphasizes the need for baseball to intensify its offence to make the sport more interesting. The Neilsen study, further states that baseball has lost its popularity among non-White, young and low earning populace. Participation in baseball has also shrunk by 3 percentage while kids who play baseball between the age of 6 and 12 are more likely to abandon the sport during the late teens in comparison to other sports. On the other side of the American sports realm, American Football is facing steady and strong repercussions due to the degree and nature of injuries associated with the brash contact sport. Brain damage and concussions have become an impediment to the growth of football in America as parents are increasingly becoming reluctant to send their children to football practices. In 2013, a New York legislator filed a bill to ban pre-teen children from playing tackle football. Moreover, the average age of football viewers has also seen a surge, just like baseball, within a decade. Basketball, however has managed to keep its line flat. The present offers cricket an opportunity to mark its guard for its second innings in America. Itâ€™s not that cricket should follow its traditional strategy to conquer the American land. Establishment of a strong first class structure, concocting a squad that can play ODI and Tests or goading the American national side to take part in International cricket would not help cricket to capture the imagination of the Americans who are already bored and jaded with baseball. Parents will have no hesitation sending their kids to cricket practices for the game of gentlemen is not life threatening as American football (Yes, Philip Hughes untimely demise says otherwise. But, it was one of the rarest and freakiest incidents in cricket). Therefore, the only way cricket can find its way in America is by providing the much needed action packed entertainment, that which the Americans wistfully wait for. Hence, cricket needs to find a different conduit to enter the USA and it seems that T20 might be the battery ram that cricket needs to break into the fortress of baseball. No, cricket should not traverse down the perilous, futile path of organizing T20 tournaments among national teams or promoting the American national side to participate in T20 tournaments. Cricket should not look at America as a nation that could manufacture talents to the cricketing sphere, but instead should view the Hollywood land as a market where cricket can be sold at a hefty price. A little research on baseball shattered my myth about cricket being a game of gentlemen. Baseball, in fact is more gentlemanly in a way that it doesnâ€™t even allow batters to do bat flips or to celebrate, since there is a conviction that it is an act of insult to the pitcher. The stigma of being a â€˜gentlemenâ€™s sportâ€™ is strongly adhering to baseball and many feel that is a strong off-putting factor for entertainment in baseball. “But here, there are too many rules in baseball. They take the fun out of baseball. In fact, I feel like that’s why a lot of African-American kids don’t play baseball. It’s boring. It is. Baseball is boring,â€ says Cincinnatiâ€™s second basemen Brandon Philips who like many doesnâ€™t like the idea of suppressing player celebrations and hence, natural human emotions. In contrast, imagine the amount of fun and braggadocio the â€œgangnamâ€ styled dance moves of Chris Gayle, giant leaps of David Warner, jet plane celebrations of Lasith Malinga and the waist wiggles of Dwayne Bravo can infuse into America, should cricket make it there? For the oppressed baseball fan, cricket might be the ideal catharsis. Furthermore, another consistent grievance about baseball is that a game of three hours hardly provides any action to enthrall the masses. A calculation by the Wall Street Journal found out that in a three hour game the average time of action is 18 minutes. A stricter definition of action would result in only 5 minutes and 47 seconds of action. The mean of number runs scored by a team in baseball lingered around 4.17 in 2013. In contrast, an innings in T20 results in runs that are zillion times more. In addition, cricket involves more action than baseball and a six is not as sporadic as homeruns in baseball. A high scoring game encompassing flamboyancy for a three hour period may very well allure Americans into cricket for who would hate to enjoy the freedom of being able to hit home runs in 360 degrees? Even though opportunities for cricket in the USA are preponderant and electrifying, it should be noted that cricket has its fair share of challenges. Cricket unlike other sports require special stadiums and finding investors to erect new cricket venues can be a migraine. But with the advent of drop-in pitches and artificial turfs, the baseball stadiums in America could be utilized to host cricket matches. 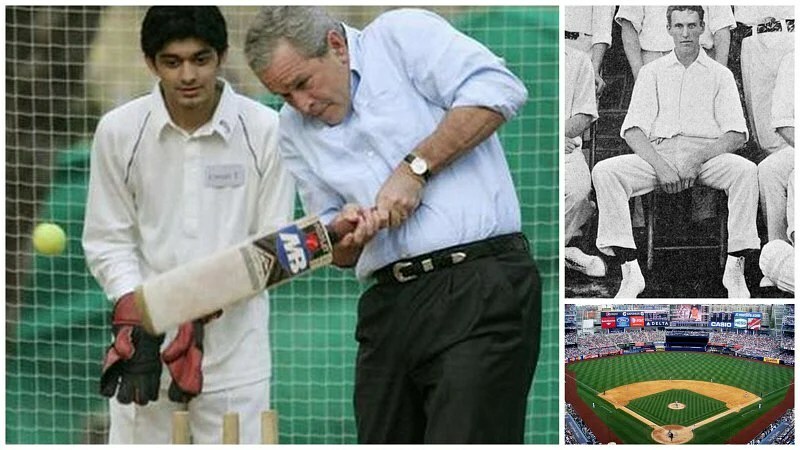 If Australia and New Zealand can play cricket in multi-sport stadiums, then the same thing can sure be done in America. Latino influence in American baseball wreaks a lot of enthusiasm among American fans and the dominance of West Indians in T20 cricket is the exact flavor Americans crave for. Cricket should begin its journey back into its erstwhile territory by first broadcasting cricket in American televisions regularly. If Americans can stay awake to watch Australian football, then it is likely that they might want to watch cricket, if our benevolent game manages to impassion America. Yankee Stadium becoming a cricket stadium- poetic justice? Just as how baseball managed to pilfer cricketâ€™s resources and talents in the USA in the late 19th century, with a successful campaign for cricket in the USA, cricket can seek the perfect revenge by turning baseball teams into cricket teams. For that matter, it is worth noting that the South Korean cricket team for the 2014 Asian Games was formed entirely of baseball players. Therefore, it is a timely decision by both Sachin Tendulkar and Shane Warne to host their Legends T20 Cricket League in the USA. With an exciting brand of cricket, cricket can slowly build itself a fan base in the USA. A mini version of IPL could also be staged and high octane games with bottomless entertainment can lure Americans towards cricket. This could be followed by establishment of leagues in America with participation of international players. But the practical constraint is whether or not India would like the concept of investing in a T20 league outside India. Obviously this will help cricket expand its territories but BCCIâ€™s current actions suggest that it wants cricket to be constricted and India-centric. Earnest investments in American T20 leagues, can yield what the modern American culture longs for- entertainment, parties and gambling (it is not illegal in the USA). On an optimistic note, establishment of T20 leagues with participation from all eminent cricketers world over and including of T20 in Olympics can definitely help the resurrection of cricket in the USA. It is time that cricket gives up on its pursuit of pecuniary benefits and starts thinking of pushing the envelope of its territories. If cricket is a religion in India, then BCCI must understand that the religion must be spread and hence, it needs evangelists. The time is ripe for cricket to settle its century old scores with baseball. Cricket needs to capture the territory that it once lost to baseball. Tendulkarâ€™s and Warneâ€™s journey of revanchism might be the first step towards turning America into a cricket nation. But will cricket invest?